With the triumphant return of the Millenium Falcon in the new Star Wars movie, we wanted to highlight the fastest hunk of junk in the galaxy. 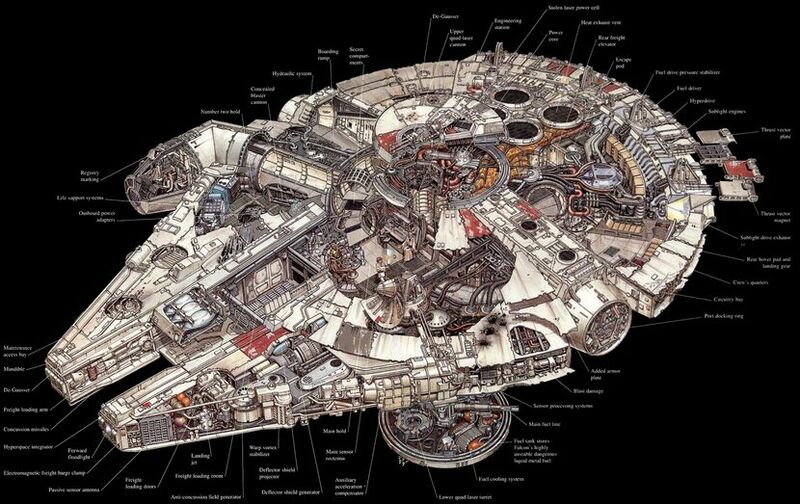 I’d venture to say that the Millenium Falcon is the most famous fictional space ship ever. Yes, more than the U.S.S. Enterprise and the Axiom in WALL-E. Star Wars geeks have spent thousands of dollars on Falcon collectibles and aren’t about to let up anytime soon. While there are entire blogs devoted to the subject, Gunaxin will now show some of the coolest Millenium Falcon items out there. Read more about the Falcon on Wookieepedia. Made by Master Replicas, this is the Holy Grail of Falcon collectibles. It’s the exact scale of the miniature from the films. With only 1,500 made, the price is steep. I’ve seen them everywhere between $3000 and $5000. Here’s another expensive, tough-to-get item. This isn’t the full ship but you get to see inside of it. Looks like it went for about $2500 but probably sells for much more at this point, with 400 out there, and weighs 300 pounds. Check it out on Entertainment Earth. For $800, you’ve gotta put this together yourself. Of course LEGO has this, a few in fact. Not cheap. This is a ridiculously expensive wall plaque. Click on link below for larger version.